Member no. 968008. Born: 30 April 1904. Town: Schönhagen. Profession: Melkerm. 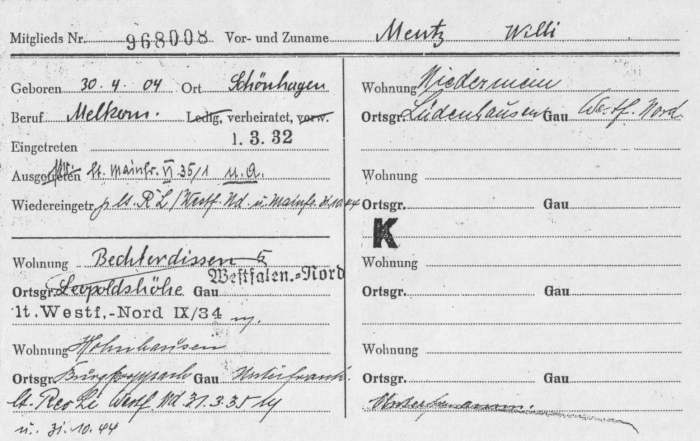 (= Melkermeister / Master Milkman). Joined: 1 March 1932. 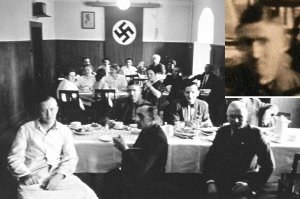 Here Mentz took care of cows and pigs, but was involved also in the euthanasia killings. He took this photo during a walk along the castle hill. The large farm building belonged to the former noble estate. The barn gate is open for cattle or hay wagons. 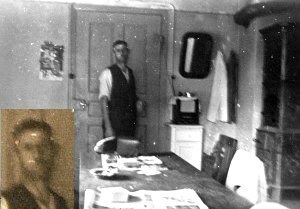 Mentz (on the right), wearing his holiday suit, standing at a window of the farm house. 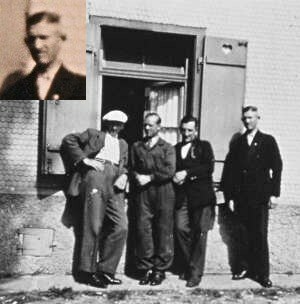 Other persons are: Rudolf Beckmann (2nd from right) and probably Alfred Löffler (2nd from left). 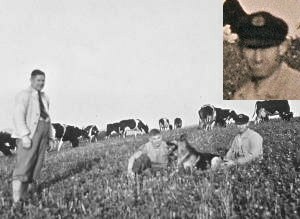 GUARDING THE COWS - 1940 ? Mentz (on the right) together with Max Möller or Erwin Stengelin (center), sitting on a pasture near Grafeneck (perhaps Hadamar 1941 - 42). The Grafeneck personnel lived in the castle and met in the dining room. Mentz is the first from left in the second row, Beckmann is sitting besides him. The euthanasia personnel got own rooms in the castle. On the right a tiled stove, on the small white cupboard Mentz' Volksempfänger (peoples' radio) is visible. 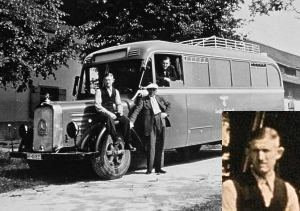 A Gekrat bus which carried the victims to the euthanasia killing sites. The bus is standing in front of the Grafeneck farm house. Mentz is sitting on the mudguard. Looking out of the bus window: probably Hermann Michel. A field kitchen somewhere in Poland or Russia. 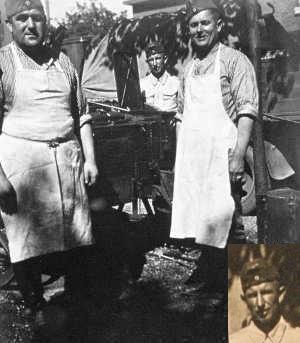 Mentz (center) is standing behind a Gulaschkanone. 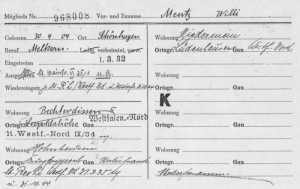 He may have been ordered to Russia in the winter of 1941, together with the T4 squad of OT. 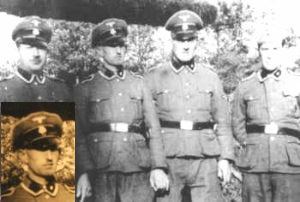 SS-Unterscharführer Mentz (2nd from left) posing with Bredow (left), Möller (2nd from right) and Hirtreiter (right). The men are standing under one of the straw sunshades in the coffee garden near the entrance gate or at the "zoo". 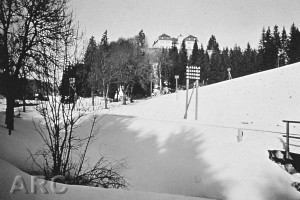 ON LEAVE IN AUSTRIA - 1943 ? 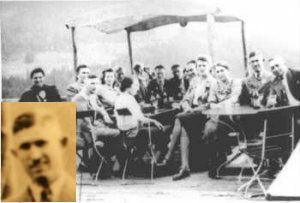 Mentz (2nd from right) sitting next to Miete, another Treblinka perpetrator. They are drinking beer at a restaurant near (?) 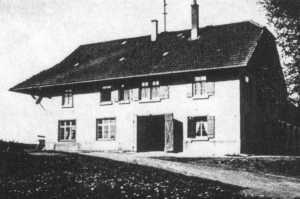 the T4 rest home in Weissenbach at the Attersee lake. After their bloody work in Poland the T4 staff was ordered to San Sabba (in Trieste) for fighting partisans and exterminating Italian Jews. The photo shows Mentz during a holiday trip to Gorizia. 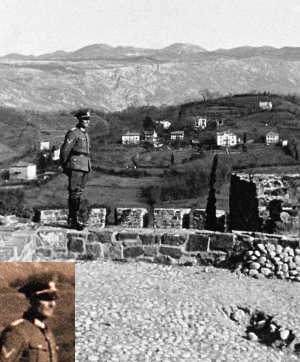 Kurt Franz, former Treblinka commander, took this photo at the old castle of Gorizia. More informations: See Treblinka / Perpetrators.